NEWS: KOF AND I BEHIND THE SCENE'S FOOTAGE OF "NEED SOMEBODY"
So this time last year me and my uber talented liverpudlian brother Kof (he edits his own videos and produces etc) collaborated on this piece of truth music. It conveys the story of two people realizing how good and beneficial it is to be loved and to receive it! The footage below is the journey before our destination. 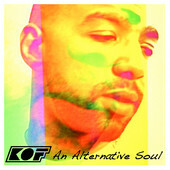 Kof's "Alternative Soul" EP is available on iTunes Now!